Rose Colored Glasses: happy mothering. 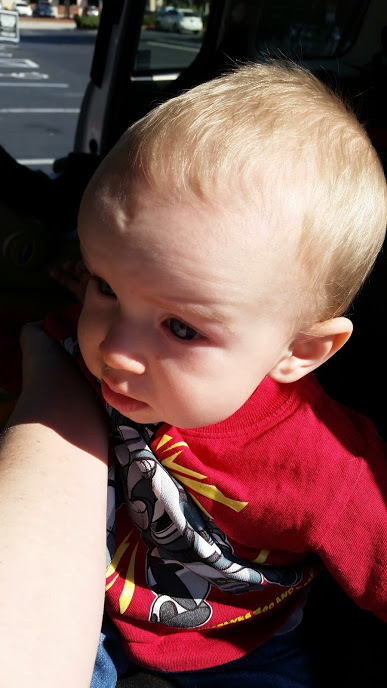 Belated weekend recap: Greg was home all weekend so we went to the market and the beach and the park and Jimmy was super smiley and Ray was wonderful and we were just spewing sunshine and roses over here. 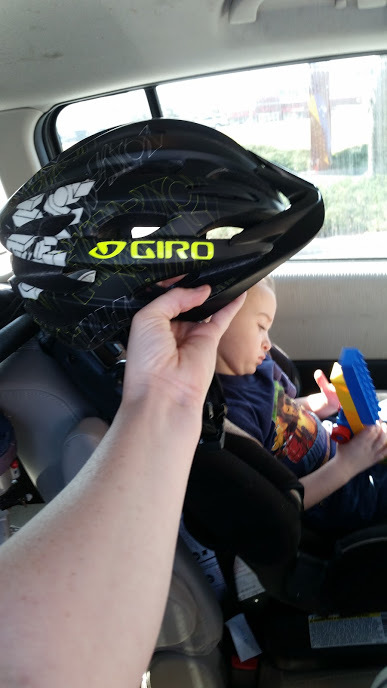 Ray got a new helmet. And I baked the best chicken in the world (according to Greg). It's from my Nourished Kitchen cookbook, only the first time I used this recipe I improvised because I didn't have all the ingredients... or time (only had 2 hrs and the brine took 8-12 hrs). This time I used my improvised ingredients and followed the slow brine instructions. The whole thing was tender and juicy and amazing. Even the breast. BRINE--plan ahead. chicken soaks for 8-12 hours. I used a 5qt pot because that's the largest I had. If you have a bigger one you may want to use that instead. Make sure whatever you use can fit in your fridge. Heat the hard cider until it's warm enough to dissolve the salt. Stir in the Italian seasonings. Let it cool to room temperature before you add the chicken. You don't want the chicken to start cooking, just let it swim around in there for a little while. Cover it and put it in the fridge. ROAST--fast forward 8-12 hours, ready to roast for 3+ hrs. This is spelled out to help you avoid crazy chicken kill-you germs spreading all over your kitchen. Heat oven to 250 degrees fahrenheit. Quarter or eighth your onion and apple and set aside. Mix Italian seasoning with the butter and set aside. Have a knife and your pan ready. Bring out the chicken and pour out the brine in the sink, rinse off any extra seasonings if you need to. 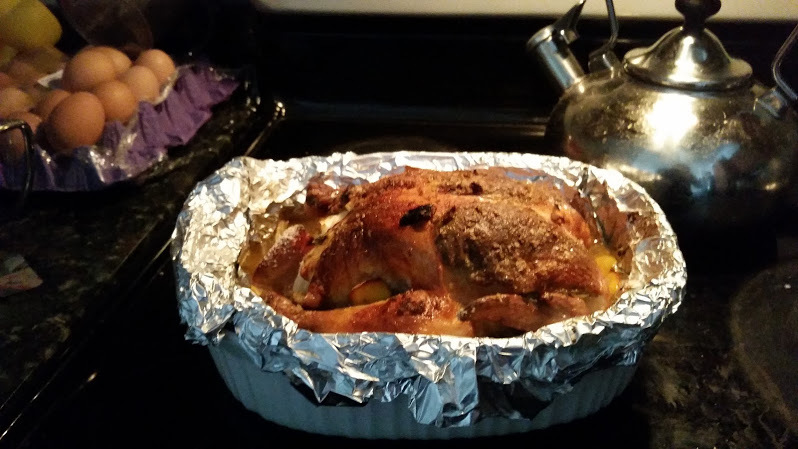 Lay the bird on a roasting pan breast up. Slit a hole in the skin near the armpit region and spread the butter-seasonings all over the breast under the skin, then repeat on the other side. Shove all the apples and onions into the open cavity. Sprinkle salt on the top. Increase to 375 degrees fahrenheit and roast for 30-45 minutes. Take it out and cover it with aluminum foil (or aluminium if you're across the pond) for 5-10 minutes. Then eat it ALL quick before anyone comes in so you don't have to share. 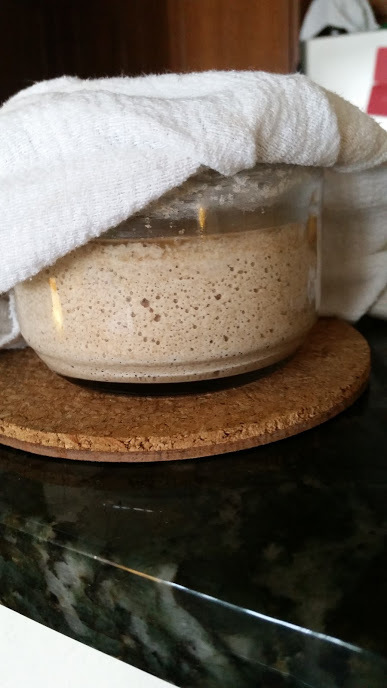 Greg and I started a sourdough starter. 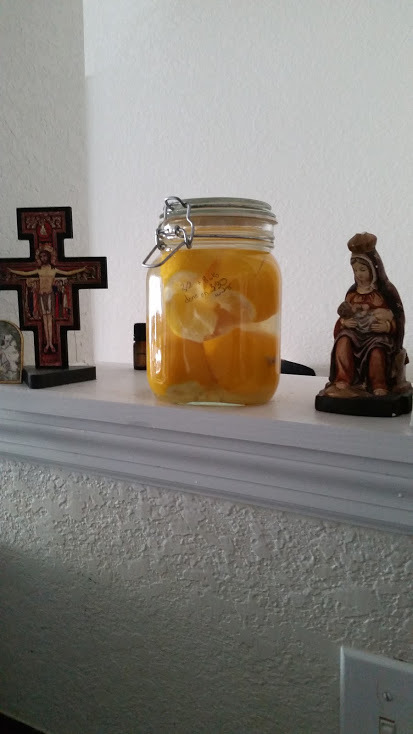 I started fermenting Meyer lemons. And I'm back to making kombucha again (woohoo!!). No shot of the mother yet, which I know you would all love to see. She's hiding for now. 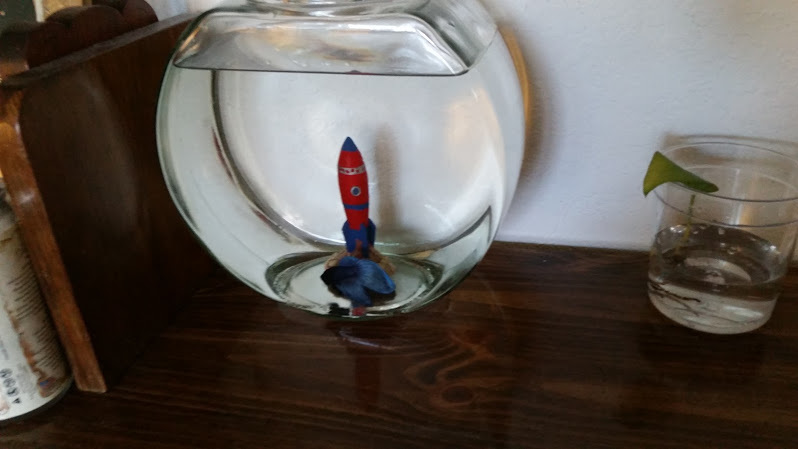 Quite unlike our brand new sparkly pet betta fish. PS- Sorry for so few pics of the kids. I need to unload some from my camera. PPS- Dearest reader, just in case I gave you the impression that everyday is butterflies and rainbows, I'll share with you a few edited texts from me to Greg during yesterday's Jimmy's wailing-all-day-fiasco. Greg is so good to me though.... his response to my 50+ ranting texts was to walk through the door with an iced coffee in one hand and chocolate walnut cookie in the other. Enjoy! any idea where my apron is?? you've cleaned. I can't find it.